Spring is such a lovely time to get away and Paris did not disappoint. Lucky for us (but perhaps not so great for the general environment) we were met with 20 degree temperatures across the weekend. My winterised skin was in total, blissful shock. I flew out from Stockholm Arlanda on Friday morning and met Jessica at The Hoxton in the early afternoon. We had a drink on the terrace where she was finishing off her day of remote working. The Hoxton in Paris is a gem of a hotel with a gorgeous lobby and outdoor space. The friendly, chatty staff are an international mix which makes the place feel very inclusive (which is perhaps not the norm in this particular capital city!). After enjoying a few more rays, we hopped in a cab to our hotel. We stayed at Hotel Adele et Jules which is set across two identical townhouses on a secluded cu-de-sac just tucked away from the hustle and bustle. Our room was in the ‘Adele’ side, we were given our key and informed that we had arrived just in time for the complimentary afternoon tea. Wandering into the cosy lounge, we poured ourselves a coffee and pocketed a few homemade cookies for the road! We then proceeded to our plush little room on the 3rd floor. We were facing in towards the courtyard but that didn’t cloud the novelty of opening our beautiful french doors and enjoying some fresh evening air. I jumped in the shower whilst Jess popped back down to the honesty bar, reappearing with a bottle of white a few minutes later. We took our time getting ready, drinking and catching up before setting off to dinner. We ate at Derrière - a French cooking flat that’s hidden behind another restaurant on rue des Gravilliers in the 3rd arrondissement. The food, in particular the slow cooked beef cheek bourguignon, was divine! Full of French fare we then moved next door for cocktails at Andy Wahloo (none of which we ended up paying for, after a rather scary slip-up from one of the bar staff who sent smashed glass flying… into J’s leg). Luckily for us, it was totally worth the wait as the food here is delicious! I’d hugely recommend it for anyone visiting Paris (I’d just advise arriving when you’re not that hungry and with appropriate clothing for queueing outside to get a table). Brunch complete, we walked to Le Sacré-Cœur and took in the views before moseying around the picture-perfect streets of Montmartre. I could have easily spent the entire weekend in just this area! 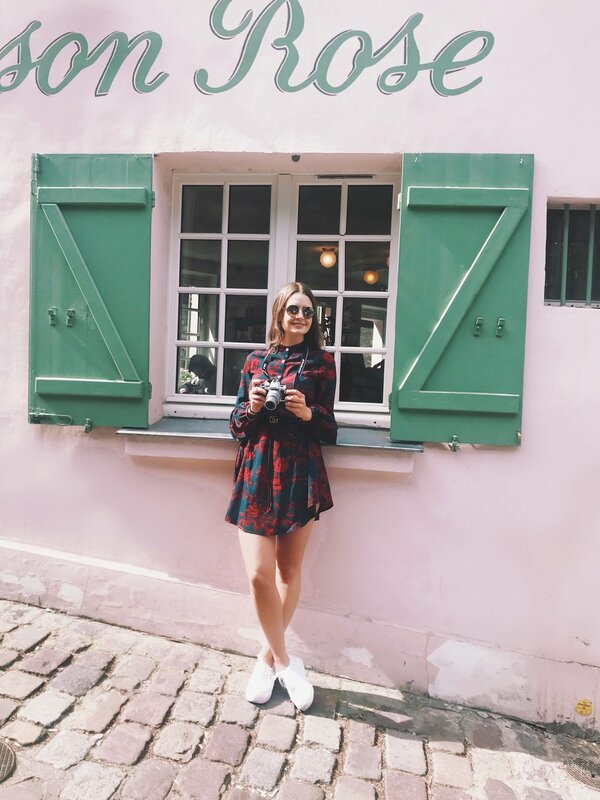 We stumbled upon the insta-famous pink cafe La Maison Rose as we were ambling back down the cobbled streets. This higgledy-piggledy little place is super pretty, although the Parisians sipping coffee outside weren’t massively impressed by the camera-clicking tourists flocking around them - pardon! By early afternoon we had made our way to Champs-Élysées. L’Arc de Triomphe was so much more impressive than I was expecting, and bigger too! It was however guarded rather sternly by the French police who were putting on quite a show of strength in light of the yellow vests. Can you spot the tank?! Next we found our way to what has to be the pièce de résistance of any Parisian weekend - La Tour Eiffel! Thanks to my trusty tour guide Jess, we also basked in it’s eiffel-ly wonder whilst sipping on much needed icy drinks in the secluded gardens of Musée du quai Branly! And finally we jumped on the metro to Tour Montparnasse where we arrived just in time to watch the sun go down and the Eiffel lights turn on! After a quick change at the hotel, we set off for dinner in the direction of Pink Mamma. As expected, there was a hefty wait for a table which resulted in a very European 11pm supper. What wasn’t as expected was the discovery of a secret subterranean cocktail bar lurking below the restaurant. Confusingly named No Entry, I was convinced we were about to be locked in the meat fridge before we finally worked out how to actually get into the bar! It’s worth stopping in here for the menu illustrations alone! As two dainty, Parisian ladies we of course live off only black coffee, snails and cigarettes. I’m therefore still baffled as to how this huge hunk of delicious medium rare steak, vat of béarnaise sauce and hearty helping of pommes frites appeared on our table. Cute plates though! After dinner we ubered to Hôtel Costes where I glugged the most expensive glass of champagne that I’ve ever had (when in Paris, darling). After champers we were keen on dropping by Little Red Door for a nightcap but sadly the clocks sprung forward and we were left with fewer, less glamorous options so - after a couple of final drinks - we called it a night! We woke up to another glorious day of sunshine and so strolled down to Palais-Royal for coffee from Café Kitsuné and a seat overlooking the fountain. After frolicking about for a bit, we finished up our tourist adventures with a stop at the Louvre and a walk down the river for lunch at St Regis by Notre-Dame. The messy looking Louvre is actually part of an art installation to commemorate the 30th anniversary of the glass pyramid. Clearly nobody had considered the consequences of covering one of the most popular tourist spots in Paris (and probably the world) in flimsy paper… oops. My first trip to Paris was a success! I got to see all of the landmarks I had hoped to visit, I ate incredible French cuisine and drank like a true Parisian, and I got to spend some quality time with JJ before she moves to LA! It was everything I’d hoped for, even if it was too hot to wear my beret… ç'est la vie!